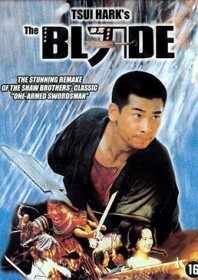 Tsui Hark’s bleak take on the 1967 Shaw Brothers classic, One Armed Swordsman. The savage beating of a Buddhist monk at the hands of a group of bandits acts as the film’s first foray into unpleasant territory, and sets the tone for the rest of the picture. Blacksmith Vincent Zhao is eager to end the group’s reign of terror following the death of his father at the hands of the bandits’ tattooed leader. The young fighter loses his bid for revenge and has his arm hacked off. But he proves to be a more persistent and potent fighter with only one arm, so he builds up his martial arts strength for the rematch. Hark’s customary quick-editing and art-house pretensions bring the story up to date, using themes of religion, loyalty and sexual desire to accentuate the drama. The film’s many bloody fight scenes dominant throughout, which at least stays true to the Shaw Brothers’ slasher heritage but, in Hark’s hands, seems to create a more downbeat and morbid picture. The use of a narrator – a female admirer of the one-armed swordsman – also makes for a puzzling and ultimately unnecessary inclusion.